In December 2016 I transitioned over to the NDIS and I’ve found it primarily a positive experience. Naturally with a new scheme there’ll be teething issues to sort out in time. I have high level spinal cord injury and require daily assistance. I’ve received adequate funding from the NDIS scheme to live, work and socialise in my community. I now live independently in a rental home in Charters Towers. 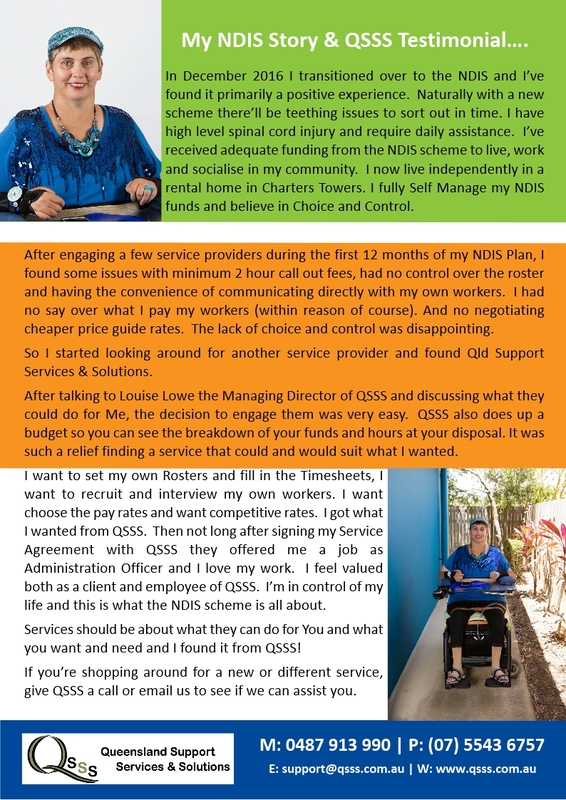 I fully Self Manage my NDIS funds and believe in Choice and Control.After engaging a few service providers during the first 12 months of my NDIS Plan, I found some issues with minimum 2 hour call out fees, had no control over the roster and having the convenience of communicating directly with my own workers. I had no say over what I pay my workers (within reason of course). And no negotiating cheaper price guide rates. The lack of choice and control was disappointing. So I started looking around for another service provider and found Qld Support Services & Solutions. After talking to Louise Lowe the Managing Director of QSSS and discussing what they could do for Me, the decision to engage them was very easy. QSSS also does up a budget so you can see the breakdown of your funds and hours at your disposal. It was such a relief finding a service that could and would suit what I wanted. I want to set my own Rosters and fill in the Timesheets, I want to recruit and interview my own workers. I want choose the pay rates and want competitive rates. I got what I wanted from QSSS. Then not long after signing my Service Agreement with QSSS they offered me a job as Administration Officer and I love my work. I feel valued both as a client and employee of QSSS. I’m in control of my life and this is what the NDIS scheme is all about. Services should be about what they can do for You and what you want and need and I found it from QSSS! If you’re shopping around for a new or different service, give QSSS a call or email us to see if we can assist you. My lovely wife Lisa was diagnosed with multiple sclerosis 14 years ago and we spent the first 9 years fighting bureaucrats and trying to adjust financially and emotionally to the changes that were happening in our life as Lisa’s condition deteriorated. We were awarded funding 4 years ago that allowed us the support required to keep Lisa at home. We were asked to pick a service provider to manage our funding and after considerable research was done we chose a service provider based on recommendation. We were guaranteed a model of service which never happened and I spent most of my time chasing them up, phone calls and emails were ignored and I finally lost patience and started looking for an alternative provider. I met with Louise Lowe from QSSS approximately 18 months ago and we discussed what she could offer in terms of service if she managed the funding. We looked at a model to suit us which included a guarantee of open communication, a same day response to any enquiry and that no shift is left uncovered. Louise assured me her business was focused on the client and that she worked with a flexible attitude. It sounded great but obviously I was sceptical because of my past experiences. Trinette Westwood became our Coordinator and we worked together to set up a system that was self-maintaining and when a problem occurred it was addressed and resolved promptly. I now have the opportunity to enjoy the benefits of the funding package because I am confident in the ability of QSSS to manage the day to day operations. Louise is a remarkable woman who has a positive and moral concept of how funding can be utilised to benefit people with a disability and their families. Testimonial of former Support Worker C.P. I could not leave without mentioning what a pleasure it has been to work for such a streamlined and competent organisation as Q.S.S.S., especially after working for some providers who are NOT client driven companies. I was with another service provider for over 20 years and as time went on, the service l was getting from that provider was get worse and yet the fees l was being charged were continually increasing. I finally decided enough was enough and it was time to investigate what other options were available. After a bit of research and speaking with other service providers, support workers and quads I decided to look into QSSS. I rang and spoke with Louise, we then arranged a meeting at my house so she could explain in further detail what QSSS could offer me. I swapped from my previous service provider to QSSS within weeks, the whole process was extremely quick and hassle free. All of my support workers come with me to QSSS, they received a higher pay rate and I received the service cheaper that l was paying so it was win win for all concerned. Following being discharged from the Spinal Unit after a long stay l signed up with a large service provider recommended to me by a social worker from the hospital. Things started off well and obviously not knowing anything different l felt l was receiving an adequate level of service. After the first couple of years and as the organisation grew bigger l became increasingly frustrated with many aspects of their service. From skyrocketing fees, very slow recruitment of new support workers, severe lack of communication between office staff and the biggest offender of `too many chiefs and not enough Indians` l had ever come across. Needless to say l had certainly had enough! l first became aware of QSSS a couple of years ago as several of my Support Workers (SWs) were already employed by them. After discussions with several people employed by QSSS l decided to call Louise who explained in detail over the phone about QSSS and also if l did want to change service providers what was involved in the transition. l was pleasantly surprised and we arranged a time to meet when Louise offered to visit me at home. Having been with my previous service provider for about 7 years l felt a little nervous and daunted about making the change. Within 30 minutes or so of Louise’s arrival l felt not only confident about making the change but it felt like a huge weight had been lifted from my shoulders. Surprisingly the transition was not only straight forward but life changing. As l mentioned earlier several of my SW`s were already registered with QSSS and the majority of my team remained with me. After a little over a year now not only am l much happier but so are my support workers. It`s nice to be treated like a person again and not ` just a number. And reasonable fee structures and flexibility to top it all off. Myself and staff are treated with respect, there is adequate training and recruitment is handled promptly, efficiently and obviously successfully. l`m not getting constant phone calls and emails from office staff and neither are my SW`s so everyone is happy. With QSSS l`m now with a pro active service provider as opposed to the previous reactive organisation l was with. Therefore l would highly recommend QSSS to any potential clients or staff.